Henry Cavill News: In the Race For Sexiest Selfie, This One Just Took The Lead! In the Race For Sexiest Selfie, This One Just Took The Lead! We thought we had seen the hottest Henry Cavill selfies (1/2) this past year. Boy, were we wrong! Talent Manager, Steven Grossman, today shared this hot pic from Sunday. Had it been just another cute photo we would have just added it to our Golden Globes party wrap, but this beauty belongs in a post of its own (all the other selfies are crying in the corner right now). 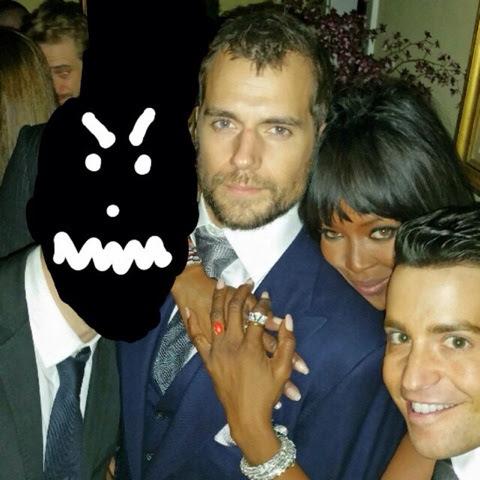 On his Instagram, Grossman posted a few more details, along with the full pic..
That time Superman, a supermodel and I tried to take a selfie... but this drunken idiot ruined our instagram shot. Thank you Mr. Grossman. We don't even know what could top this.. smolder away, Henry Cavill! @HenryCavillNews Even Naomi Campbell loves him! @HenryCavillNews Go on Naomi! Show'em how it's done! WERK! @Steven_Grossman @NaomiCampbell @TheEllenShow @HenryCavillNews As we're all connected we ALL enjoyed this selfie! HC is such a great guy! Hmmmm.... that's kind of a racist comment. Mr. Cavill has posed with his fans of ALL races, creed and color; so why refer to Naomi as "The Black Panther"? anon at 6:22 -- We may be wrong, but the reason we allowed the comment was because we think that's her known nickname? -- Don't think Marie meant it with any disrespect. Wants wrong with henry nose ? Has he got a spot or bruise ?